These boards are super rigid, warp and dent resistant, and excellent choice when you need to mount a poster or print that will resist damage from the corner or surface. 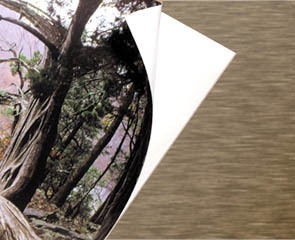 They are rigid, lightweight digital imaging panels, with polycoated white and black paper facers and extruded polystyrene core, is warp free and perfect for photo mounting, silk screening and vinyl lay up. The Peel N'Stick boards have self-adhesive backings. Suitable for interior signage, exhibits and point of purchase displays. These are ideal for mounting a variety of materials including computer-generated digital graphics, photographic papers, prints, artwork, posters, drawings, charts, and virtually any type of paper or plastic and will be a permanent. 725 points will be rewarded when you are logged in to your account and buy this item.